It all started when I was little, around the age of 5. With the hands half in front of my eyes full of excitement watching Jaws, my mom didn’t want me to look, but I squeaked between my fingers. Many nightmares about swimming pools and sharks later, I was constantly triggered by the great white shark. In spite of the fear, I was so fascinated and impressed. I also looked at every documentary on Discovery channel and am a big fan of shark week. 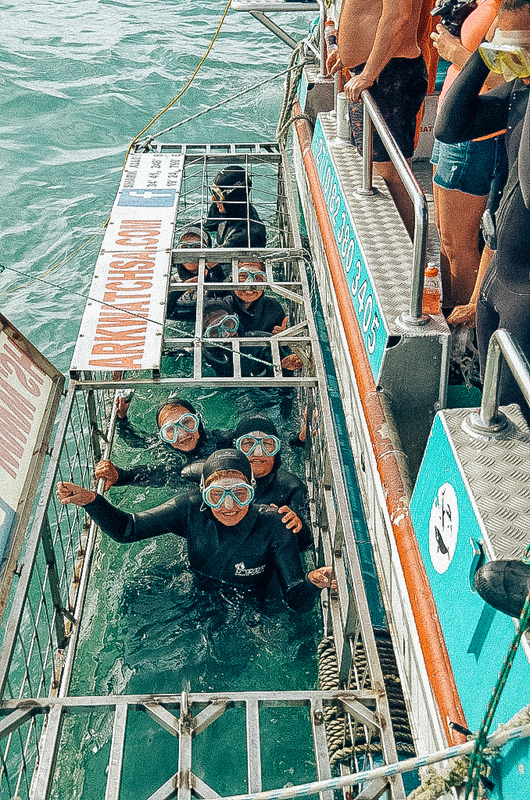 It was certain I wanted shark cage diving on my bucket list and overcome my fear. Beyond my expectation, I could tick this off the list pretty quickly. By lucky chance (“Serendipity”, see my last blog) I ended up in Gansbaai. 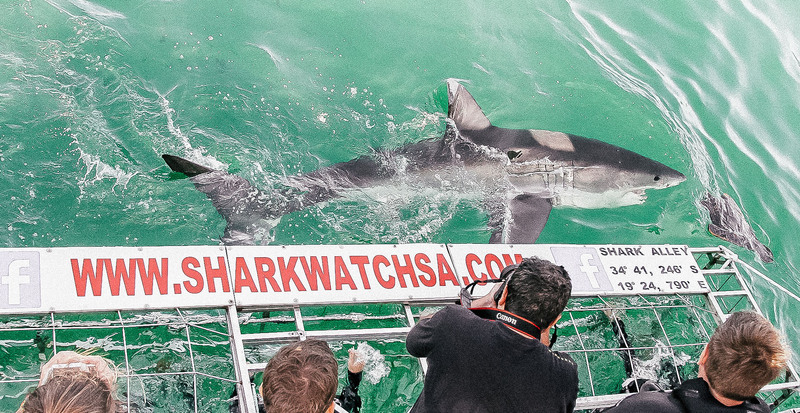 And now let Gansbaai become one of the 5 hot spots in the world for the white shark! My first dive was with Marine Dynamics. The founder is Wilfred Chivell, a committed marine conservationist and the father of Dickie Chivell, nature conservationist (You might have seen him on Shark Week doing crazy stunts with Great White Sharks). The whole Marine Dynamics team exist of all caring & passionate people. You arrive early in the morning, first, you have breakfast and briefing, what you can expect and do's & don'ts. 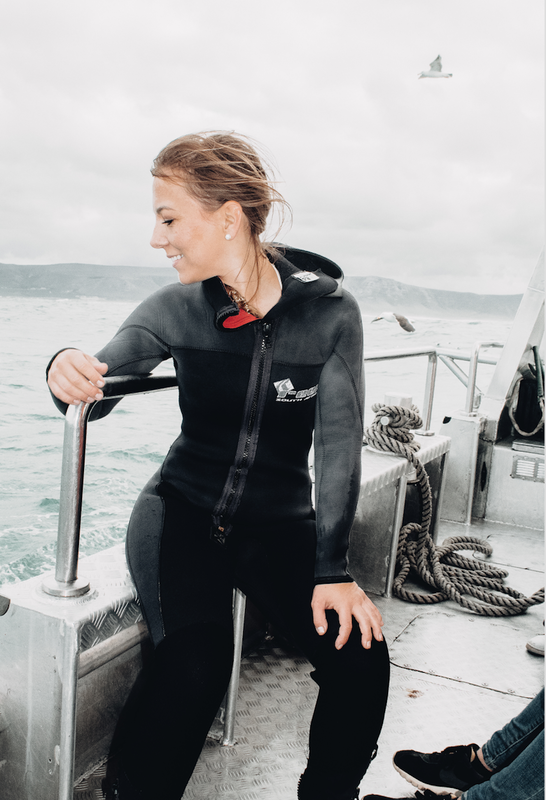 You also receive a wetsuit and shoes, according to your specified size and if you want to see the sharks underwater, if you are not so a daredevil you can watch them closely from the boat. Once on the boat, we go towards Dyer Island, shark alley the famous place as on discovery channel. After 20 minutes of sailing, we drop anchor. And it's time to put on the wetsuits. Meanwhile, they are dropping the cage into the water. Sometimes it is better to take a pill against motion sickness because it can wiggle back and forth with heavy waves. But if you would get seasick, you will be greatly assisted by the crew, they are prepared for this. We can go in the cage with eight persons before we crawl into it I get some weights and goggles (to see easier underwater). The water feels pretty fresh in the beginning, but once you're in it you'll be fine. You already feel the thrill of the action that is coming. They throw a sort of soup slurry of fish left in the water and a board with rope to attract the sharks, they do not use blood like in the movies. The seagulls are also immediately there. Wait a bit and there is the first shark! We quickly head down in the cage and see the white shark approaching... closer and closer to the cage then his jaws open... WAW Fascinating! I felt the thrill in my whole body but especially of excitement not of fear. I did not expect this, I felt such a respect for those magnificent sea creatures. And they did not look as frightening as on TV. I was so impressed by their beauty and perfection. These are not murder machines, but creatures with instinct. They are the guardians of the sea. In the meantime, I have done shark cage diving three times, every time was a different experience, also because the ecosystem is changeable. If, for example, killer whales enter their territory, the sharks will retreat a little. There are many sharks on dyers island because there are many seals and that is now the favorite meal of White sharks. In 2018 the white sharks did not seem as numerous as before. Research is also being done on Sharks behavior and precious marine species and the ecosystems in which they live. Orcas (depending on the species) in the surrounds, who love a tasty bite and eat especially the liver of the shark. Illegal shark catch, in China this is still a delicacy (shark fin soup) and they still believe that animals possess medicinal ingredients. Global warming due to climate change, etc. Environmental changes, pollution of different kinds. Last September we saw no white sharks but copper sharks as well as Sevengill sharks, they dare to swim in these parts as the white shark wasn’t a big threat then. The seals also flanked around the boat, they even ate a small baby shark! The reverse world. Less white sharks equal more seals, means fewer penguins, yes seals eat penguins! And the African Penguin is endangered. So you see the entire ecosystem tilts, balance is so important, in everything. We feel that the White Shark and its environment have to be protected as a whole. In the meantime, more white sharks have been spotted again luckily! But you see everything has an impact, so also realize that you can make the difference. Going on a trip with marine dynamics you contribute to the conservation of sea wildlife. If you want to know more about shark cage dive trips, whale watching cruises in Gansbaai or book a trip, you can also contact me for this. Written by Annick Villa The Cherry.